This stunning family villa boasting exceptional sea views is a blend of classic Andalucia architecture & striking contemporary design. At the centre of this spacious property is a modern recreation of a traditional Andaluz courtyard, home to the imperial staircase that links the three floors. On the ground floor you will find ample living and dining areas, all centred around the courtyard below and leading to numerous terraces and water features. You will also find a spacious open plan kitchen with island and a guest bedroom suite. The first floor is again set around the central atrium with feature lounge areas. The large master bedroom suite boasts his and hers dressing rooms, large ensuite bathroom and private terrace. There are three further guest suites, all with dressing areas, ensuite bathrooms and terraces. In the basement you will find a gymnasium, spa and wine cellar with further terraces including an intimate sunken lounge area set next to the cascading water from the swimming pool above. Additionally there is garaging for 6 cars. 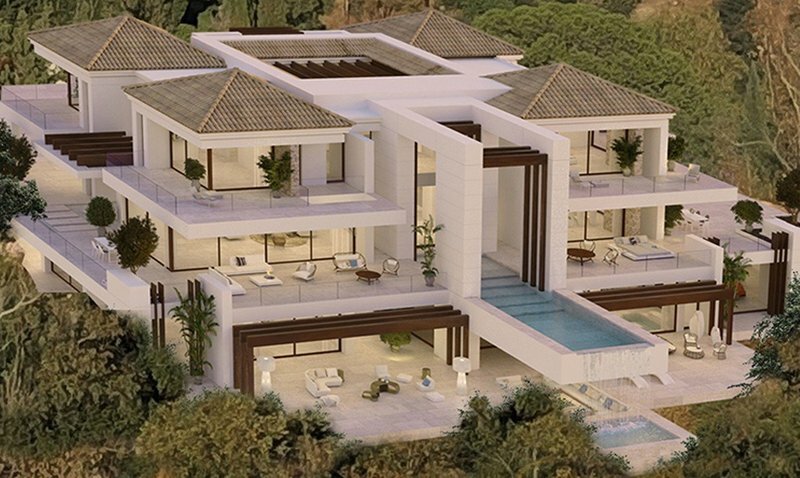 This is a truly unique property in a privileged location and representing an exceptional investment opportunity.